At SIHH 2016 Panerai revisited its past with a number of new models in a variety of cases and dial colours and functions. Of these my personal favourites were, perhaps of some surprise to me, these two. I’ll explain why a little later. The new Radiomir 1940 3 Days (PAM662) is a re-creation of the Egiziano Piccolo (‘small Egiziano’) Ref.6154 that was originally made in very small quantities of some 30-40 exemplars, but what makes it distinctive is that Officine Panerai have chosen to update it with what many watch people informally call a ‘tropical’ dial, but which I prefer to simply call ‘faded’. It is basically meant to be the colour of a dial showing the patina of age. The Ref. 6154 on which it is based had its genesis in a 1954 training exercise. The Egyptians had sent members of their military to La Spezia for training and found themselves amazed by the equipment used by the Italian Navy (Marina Militaire), particularly the luminosity. So much so that they placed an order from Panerai for compasses, depth gauges, and watches; it is estimated that 30-40 were ordered of each. Containing a Rolex Cal. 618 movement, the original 47mm Egiziano Piccolo has a Rolex case with new specifications that had never been seen prior, its sleek curves granting it descriptions comparing it with sports cars. The Egyptians had insisted on a Radiomir dial despite it not longer being in production, and the radium part of the Radiomir has meant that with time, variants in humidity, sunlight, temperature etc, each of these rare beasts has developed its own distinctive marking and patina. Naturally, these modern versions are lumed with Super-LumiNova, so these will not all develop their own look, but as the original is a scarce thing, this is not a bad modern compromise in terms of looks for those (most) who will never be able to have the original. For both of these tribute models, the ‘vintage’ inspiration extends to the crystal, which is plexi. They both comes with a spare plexi crystal. To ‘match’ this Radiomir 1940 Panerai have simultaneously released the PAM663 Luminor 1950 3 Days Acciaio, which shares the same ‘tropical’ dial and 47mm size. In this model, the brown dial appears in a 47mm Luminor 1950 case. Both the PAM662 and PAM663 contain the hand-wound Calibre P.3000 which is realised with brush-finished bridges and as the name of the watches indicate, has a power reserve of three days. From a practical point of view, you may note that it allows for the hour hand to be set independently. They come on brown Ponte Vecchio strap with ecru-coloured stitching and an engravd OP logo. Now – back to what I mentioned at the outset. I am not one of those who gets excited about ‘tropical’ dials as certain brands/ collectors/ enthusiasts like to call their faded vintage dials. They’re just faded brown dials to me, of varying levels of patina-d attractiveness, and I do find it somewhat bemusing that how faded or the way in which a dial is faded can result in a premium at auction. Panerai is not the first brand, nor will it be the last by any stretch of the imagination, to try a modern ‘recreation’ of a colours that result from the natural process of ageing. Bearing in mind my bemusement about such dials in general, I was surprised to find myself quite drawn to how Panerai have coloured these dials. They do not look too ‘shiny and new’, as is often the danger when doing such things, and regardless of the inspiration of the colour, the tone of it has turned out really quite well. These are appealing pieces, but if I was to choose one of the two, and in fact if I were to pick one watch from Panerai’s SIHH 2016 releases, it would be the PAM662. 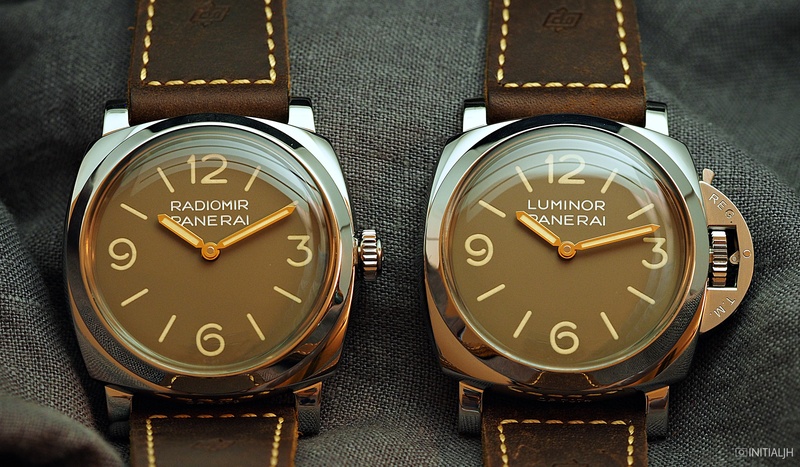 The PAM662 is priced at 9,500 EUR and the PAM663 at 9,900 EUR.